Leathered granite, also called antiqued granite, is a great counter top choice for kitchens. It’s durable, beautiful & works with different design styles. 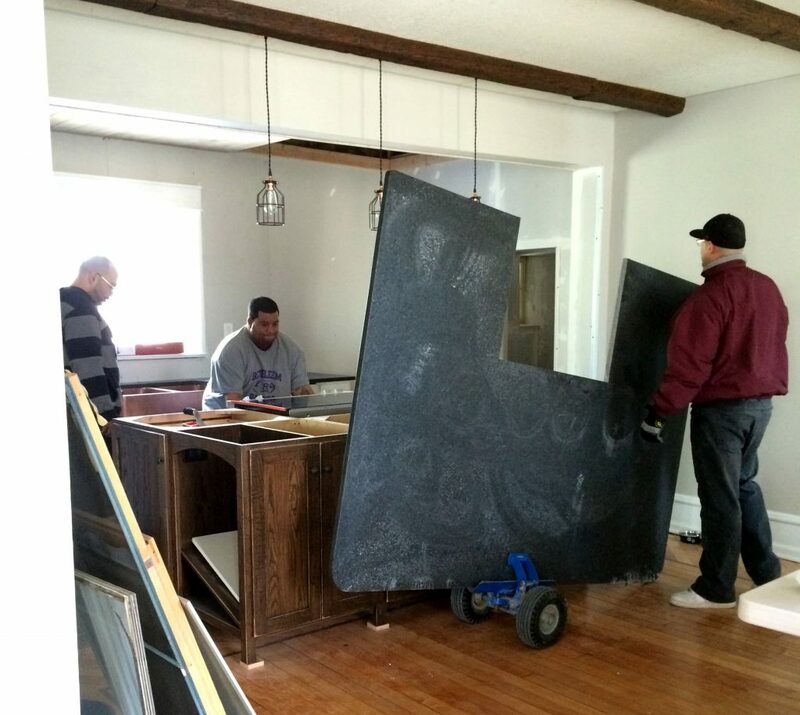 Here’s our experience with purchasing, installing & living with leathered granite. Every time I post a picture of my kitchen on Instagram, I have multiple people asking me for details on our counter tops. 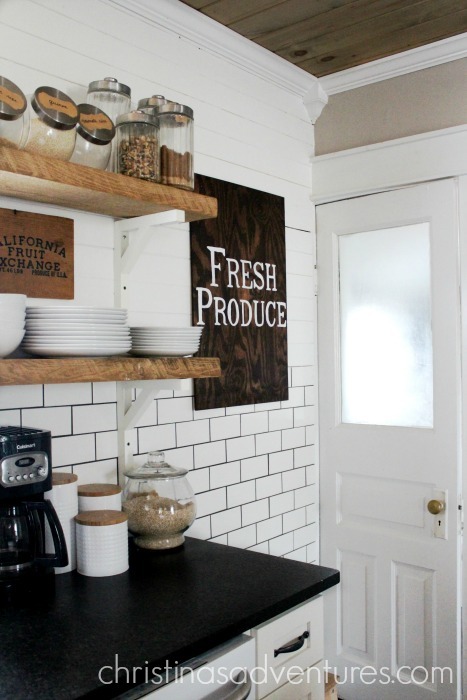 It’s one of my favorite parts of our big kitchen makeover! I knew that we wanted to do something matte in our kitchen. 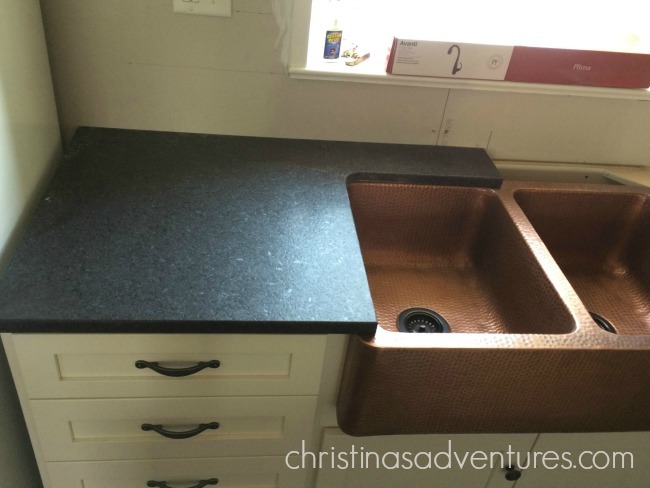 I wasn’t a fan of super shiny finishes, and didn’t feel like it would fit in our farmhouse kitchen. Our family also needed something low maintenance and durable, since we heavily use this kitchen and are raising our kids in this home. 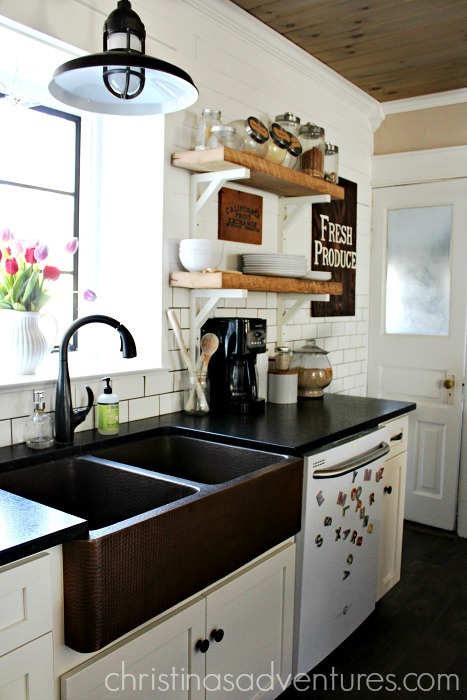 I loved the look of soapstone, but when we went to a place to get prices, I was quickly discouraged by the crazy price tag that came with it. Not only that, but they told me that soapstone could be hard to maintain over the years, and it may be tough with little kids being rough on it. I quickly realized that soapstone was not the right fit for our family! Granite is actually really relatively inexpensive right now, so we began to look at that option. The man at our local granite source pointed me to leathered granite (also called “antiqued granite”). I had no idea what that was, but I was interested. When I found out it was about half the cost of the soapstone, I was so excited! And then when I found out it was super low maintenance and durable, I was absolutely sold. Now that we’ve been living with this kitchen for over 3 years, I can tell you we’ve had zero regrets about our counter top choice. It’s super durable, low maintenance, and it looks just as great as the day it was installed. There are products you can use to seal your granite counter tops to make sure they are protected. I thought these were really expensive, but then I found out that you can get them really reasonably priced on Amazon! Here’s my affiliate link so you can check out all of their selection. 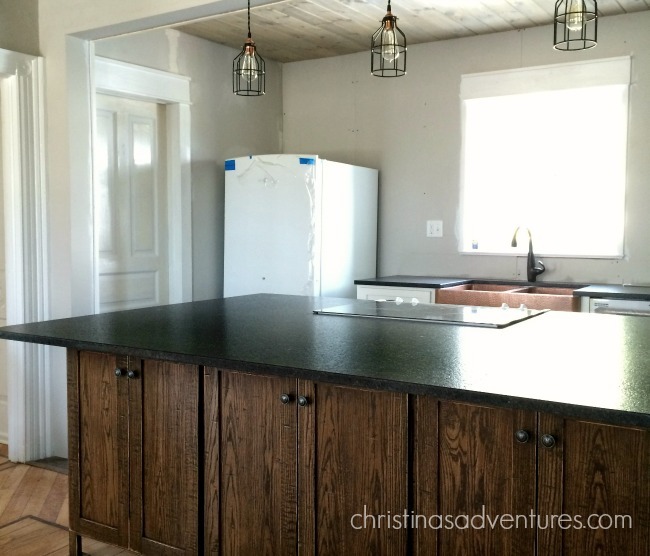 When we got our counter tops installed, it cost just about $3,000 for our counter tops. That’s from start to finish – installation included. That sounds like a lot, but remember that we have much more counter top square footage than the average kitchen! So if you’re looking for beautiful, quality, durable counter tops, see if you can go find a slab of antiqued or leathered granite! Obviously it will vary by location, and you should always do your research, but we are thrilled with what we bought! Like this post? Please share with others & save for later by pinning on Pinterest! And if you’d like to see more from me – please sign up for my newsletter below! Hello! 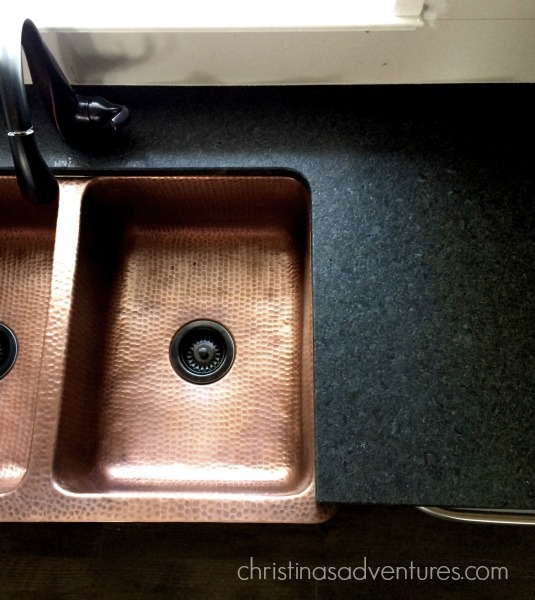 How do you clean your copper sink? 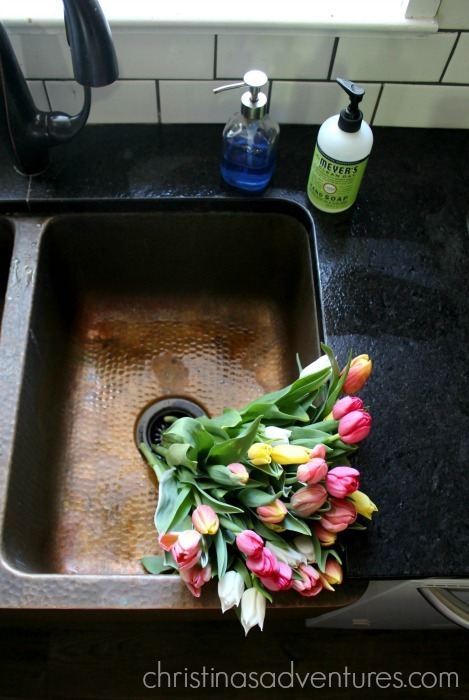 I have a copper sink too, but I haven’t found the best way to take care of it, yet. They look textured, kind of like leather…are they? Hi there! What color did you go with? I am looking for a black leather. Yours look beautiful! I just chose this for our bar. It’s not even in yet, but I’m so excited! Here (in Canada) it is called Cambrian Black Leathered Granite. I like that, unlike polished black granite, it won’t show streaks and every droplet of water. So glad you like it, that comforts me! 1. 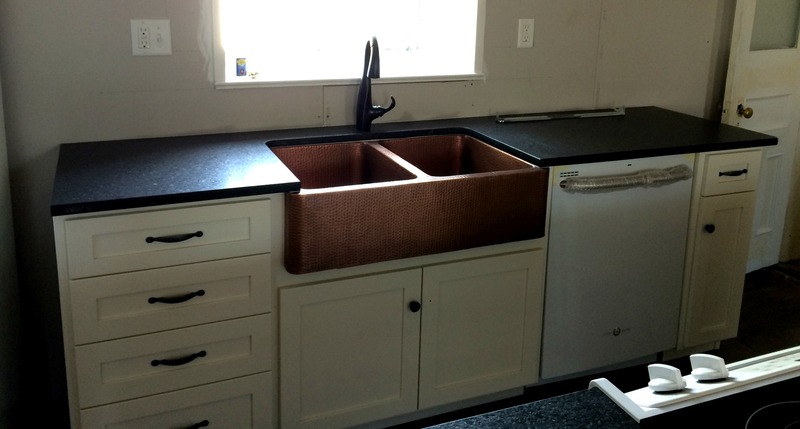 Kitchen counter – demo, installation & granite slab = $3,000. You said, it sounds like a lot but you had a lot of space to cover. Measurement wise i don’t know how much you had to cover but i have a small kitchen and I am finding that demo & installation alone is running $3,000 not including the granite slab! Did you have a contractor and or fabricator do the work? 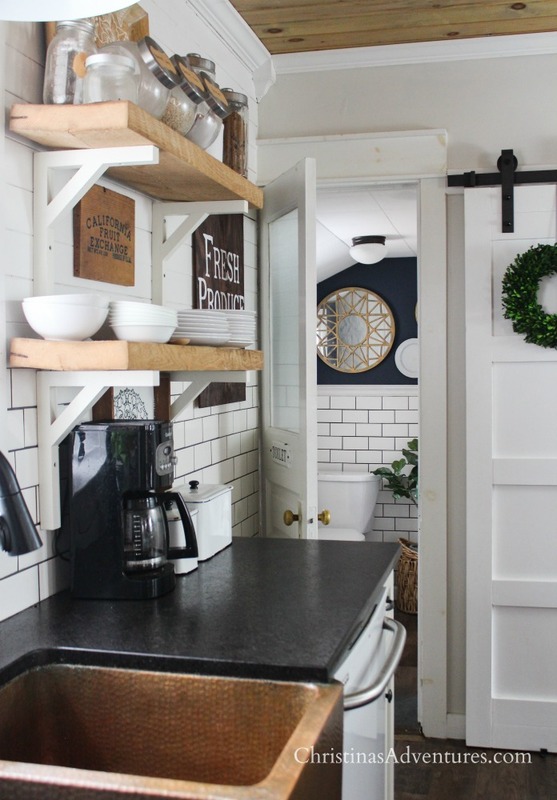 And your kitchen cabinets the white one’s are they IKEA & the handles where are they from (can you post a close up shot of the handles. thanks for any helpful info you can offer. Hi Holli! The granite and installation was $3,000. We did the demo ourselves 🙂 We went through a local place called Prestige Marble & Granite. We also got our cabinets made from an Amish woodworker who makes solid wood cabinets – and also has his own hardware supplier. Sorry I don’t have hardware details for you! Did you need two slabs? We are in the process of remodeling our kitchen and we just selected a mid-grade leathered granite. I was told by a friend that just the edge of the counter top is expensive because of the special materials they need to give it the leathered look. Did you find this to be true? Also, is the 3k including the cooper sink? You definitely got a deal on your counter top. I am looking at that and it is double what you paid and not as big as a slab as you had. It is costing as much as marble. Not a reasonable cost for the average person. 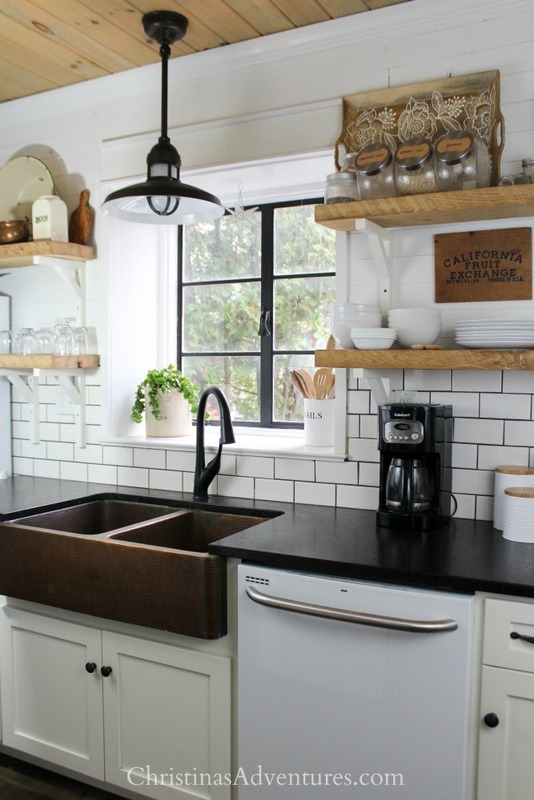 Love your kitchen! I was granite shopping the other day and had never heard of leathered granite and fell in love. The only color they had was black – do you find it hard to keep clean? I was nervous that you’d see droplets of water and all the crumbs. Any feedback on that would be appreciated. I have small kids too. Thank you! Thanks so much for sharing your experience! We are looking at granite for our kitchen and have fallen in love with a leathered Titanium granite, but my husband is worried about the texture. Do plates and glasses wobble on the granite because of the texture? Your feedback would be a huge help! Thanks!! How about baking and rolling out dough? Have you ever tried it on the leathered surface? I havent! Sorry – I so don’t do baking like that haha! Do you have an enhancer on your stone? I really love the dull look of honed absolute black but hear that without an enhancer the honed and leathered granite show fingerprints and that they are almost impossible to remove. Beautiful kitchen. Wow, that is a huge slab on the island. I was wondering if you had to do any reinforcement work below to support the weight? Did you check with an engineer to see if your span, assuming you have one, would support the weight of not only the island but also the potential live load, people gathered, furnishings, appliances. etc. I had to laugh at your comment regarding the baking. C’mon now, that is a ‘farm” kitchen, I can smell the apple pie. Do you know if brushed is the same as leathered? 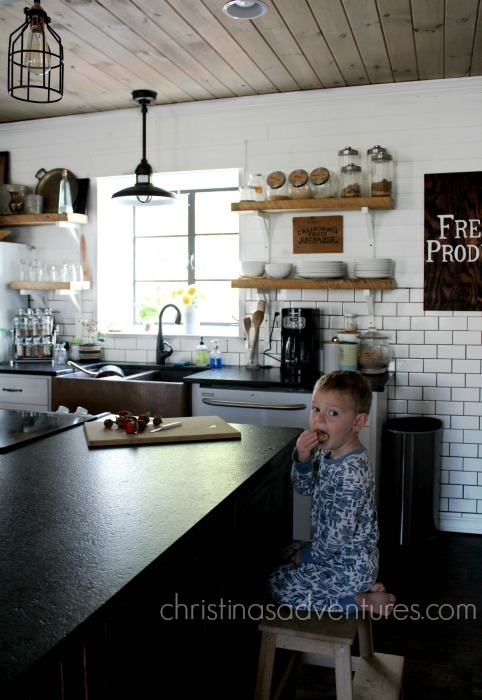 I have kids and it was between leathered black granite or white quartz on the parameter countertops in the kitchen. I wanted low maintenance. Both had pros and cons. Your post actually inspired me to go with the leathered, thinking brushed was the same as leathered. We chose the black brushed, which at the time I assumed was the same as leathered (I’m still so confused about the terms). Then I read online where brushed is very hard to keep looking clean. Now I’m not so sure that we made the right decision. Thanks for your advice. We chose negresco brushed. Ever heard of it? Also, thanks for this amazing post! Sorry, Casey, I have no idea! I’ve never heard of brushed granite so I don’t feel like I can help with your question 🙁 Sorry!